H-Harness measures 11.5 inches. Optional on the Snappy Seat System, Blue Bucket Seat, Gray Bucket Seat, 1400 Seat Back, 1400 Full Padded Seat Back or 1600 Simple Seat Back. Comes with a carabiner that fastens the two shoulder straps behind the neck so they don’t slip down. 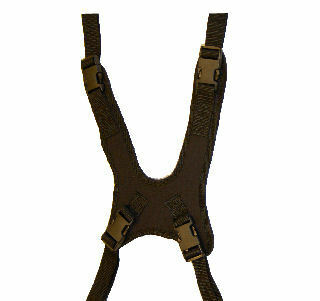 The H-Harness provides additional trunk support for riders with low muscle tone. Measures 11.5 inches. Optional on the Snappy Seat System, Blue Bucket Seat, Gray Bucket Seat, 1400 Seat Back, 1400 Full Padded Seat Back or 1600 Simple Seat Back. Comes with a carabiner that fastens the two shoulder straps behind the neck so they don’t slip down.